Every morning, I start by reading my Bible. Right now I am using a few apps on my tablet to give me a daily reading passage. She reads truth is a good one, as well as Daily Bible, which has a widget with a verse right on your home screen. I read that verse, and then read the whole chapter for context. If you are working through a book of the Bible, that is great, too! Often, as I read, a smaller section of the chapter pops out at me. Sometimes, it’s just one verse. Since I’m usually nursing first thing in the morning, I don’t work on my Bible journal right away, but simply ponder the verses. At breakfast, I usually pull out my notebook and fill out a page from the passage I read that morning. I plan to share some of those pages with you, and give you ideas for studying your Bible in a more visual way. If you have a great method for studying, then by all means, keep at it. This series of posts is for those that would benefit with a more hands on and visual approach to Bible study. Join us every Monday for the next page. But his delight is in the law of YHVH; and in his law doth he meditate day and night. The first page in my notebook is Psalm 1:2 ESV. I read the whole chapter and verse two stood out as significant. 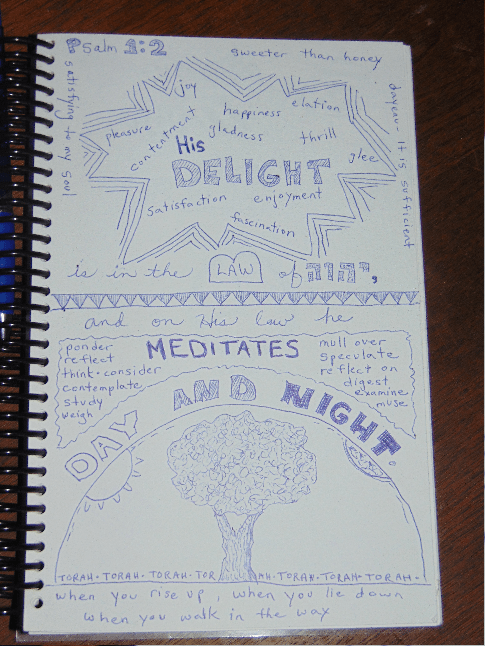 How fitting that the first page in my Bible journal would be about meditating on Scripture! Here’s a look at my first page. I want you to know that I have a half sheet of cardstock and a blue ball point pen. That’s it! No fancy markers. No special paper. While I want it to look nice, the goal is to get in my Bible and apply it, not create an art journal. Use what you have and go from there. I feel there is a benefit to having a notebook to keep all your pages together. Aside from that, keep it simple. The Bible is written in very concrete terms. Use pictures to help you bring out those visual pictures. This can be as simple as drawing a tablet around the word law, or drawing the healthy, flourishing tree to visualize the prosperity of those that love and study the Torah. Meditating on Scripture is wonderful, but when you are able to attach physical objects and concepts to it, your understanding will increase. You now can attach the spiritual idea to a physical idea that you already are familiar with. Look for references to physical objects and draw them onto your page. 4. Decorate if you like. I confess, this page took me a few days, but I enjoyed adding a few decorative flourishes. I used a few block letters and a zigzag border across the middle of the page. It looked nice, and I continued pondering the verses as I drew. If this works for you, great! If you feel intimidated by adding pretty details, just forget them. Again, the focus is on reading and studying Scripture in a visual way. This isn’t art class. Do you feel this would be a good way for you to get more out of your Bible reading? Do you have a notebook ready to get started? Tell us about it in the comments! Join us next Monday for another page from my journal. Thank you for sharing a page from your journal. I’ve used journaling but I had never thought to make it so visual. I love this idea and will be adding it to my study tools.